The breadth and impact of Black Lives Matter in the United States has been extraordinary. Between 2012 and 2016, thousands of people marched, rallied, held vigils, and engaged in direct actions to protest and draw attention to state and vigilante violence against Black people. What began as outrage over the 2012 murder of Trayvon Martin and the exoneration of his killer, and accelerated during the Ferguson uprising of 2014, has evolved into a resurgent Black Freedom Movement, which includes a network of more than fifty organizations working together under the rubric of the Movement for Black Lives coalition. Employing a range of creative tactics and embracing group-centered leadership models, these visionary young organizers, many of them women, and many of them queer, are not only calling for an end to police violence, but demanding racial justice, gender justice, and systemic change. Barbara Ransby is a historian, author, and longtime activist. She is the author of the acclaimed biography Ella Baker and the Black Freedom Movement. Ransby was one of the founders of African American Women in Defense of Ourselves in 1991 and the Black Radical Congress in 1998. She is the editor of the journal Souls: A Critical Journal of Black Politics, Culture and Society, and Professor and Director of the Social Justice Initiative at the University of Illinois at Chicago. Visit barbararansby.com for tour dates and speaking engagements. 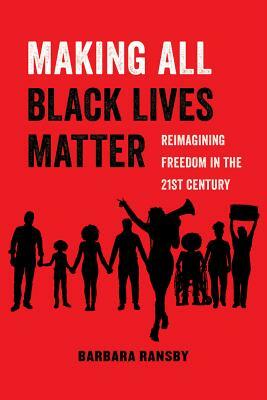 "In a political moment where Black liberatory work rarely includes time for archiving, reflection, and record-keeping, Making All Black Lives Matter is a critical contribution. . . . Essentially, where mainstream narratives proclaim that movements and protests simply erupt erratically from anger, pure emotion, and vengeance, Ransby is a balm. She shows how every mass-led struggle sits atop the labor, sacrifices, and investments of many organizers who will never be seen, named, or rewarded for their contributions."